First annual #DayWithoutCars comes to @ASU. If you happened to notice more maroon and gold than usual Tuesday on Tempe's bicycles, trains and buses, it wasn't a coincidence. As part of a coordinated effort to further sustainable transportation efforts, nearly 400 Arizona State University students and staff members signed a pledge to take an alternate, non-single occupancy vehicle mode of transit to campus on March 27. "I think there’s a lot of potential to continue to encourage sustainable transit use beyond this event, which is really meant to just be a pilot," said Lesley Forst, program manager at ASU's University Sustainability Practices. "We hope to run similar events like this one in future semesters." University Sustainability Practices anticipates Day Without Cars becoming an annual event after Tuesday's success. Assisting in those efforts was a weeklong tabling event held March 19–23, which featured volunteers at on-campus parking structures busting transit myths and providing transportation guidance ahead of Tuesday's event. Emmery Ledin, who helped lead the efforts for the event on behalf of the Staff Sustainability Committee, notes that sustainability isn't the only gain for those who start ditching their cars. "Soon, at least on the Tempe campus, we will have less and less space for personal vehicles and parking for those vehicles," Ledin said. "So there are other benefits to taking alternative modes of transportation that extend beyond environmental sustainability." Some Sun Devils who took part in Tuesday's event shared their stories using the #DayWithoutCars hashtag, which earned Sun Devil Rewards points for participants. This initial Day Without Cars was targeted mainly at ASU staff members, as 75 percent of staff drive single occupancy vehicles (student use is about 28 percent). They also travel to campus five days a week and often go longer distances than students, making their carbon footprint about three times that of the average student. "ASU has a goal to be carbon neutral from transportation by 2035, and right now, commuting contributes about 26 percent of our total GhG emissions," Forst said. "If we can get more staff to try sustainable transit options, even if it is only a few times a week, we could potentially have a significant impact on reducing our carbon emissions as an institution, not to mention the added benefits of reducing traffic congestion and air pollution." The university's Day Without Cars served as a precursor to Earth Month, which will be recognized at ASU through various competitions and events. Arizona State University President Michael Crow sent an open letter on March 28 to the ASU community committing ASU to be the largest fair trade university in the U.S. The commitment is in partnership with Aramark and Follett. Participating vendors must provide signage and education about fair trade certified products. Aramark already provides fair trade resources when it caters campus events. ASU School of Sustainability graduate student and Aramark intern Hannah Trigg invested three months in drafting the fair trade commitment and implementing most of its provisions, and then partnered with University Sustainability Practices for the final steps in securing the commitment. Biological sciences junior Daniella Simari continues to lead tabling events, education and outreach. Four ASU students will attend a national conference and showcase fai trade innovations in late March. They also plan to host a lecture about fair trade clothing in partnership with The Fabric Studio and the ASU Global Institute of Sustainability on April 27. Campaign organizer and Japanese senior Sydney Williamson connects the ASU community to parts of the world most affected by fair trade practices. The campaign asked students to write Valentine’s Day cards to farmers in Ecuador, Ghana and Philippines. In April, Asian Pacific Heritage month, the campaign will bring more awareness to tea grown in Asia and India. Students can further the university’s commitment to food reconnection when they purchase fair trade products. When employees purchase fair trade food, they can earn points on a green office or event certification. 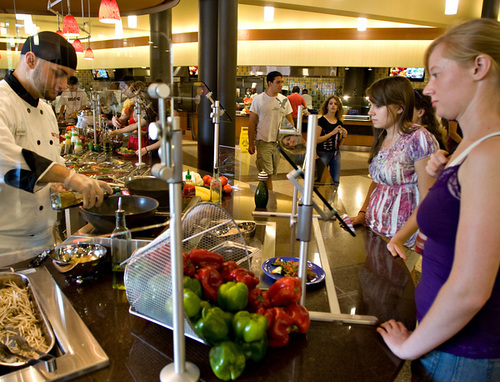 Learn more about ASU’s food reconnection goal. Learn about how to become involved in collaborative sustainability action on campus.